Hey guys — we did it. We survived another year. We made it to the finish line. 2019 is coming at us and it's going to be shiny and bright and full of incandescent joy! Well okay, maybe it's a little early to be making predictions, but at least your New Year's Eve can be shiny, bright and full of joy as you party the day and night away. There is something to be said for NYE in Erie, because the crowds aren't nearly as oppressive as they are in your larger metropolises, but you still get all of the hoopla (and at whatever level of excitement you want your hoopla set for). Here's your going-out guide for NYE 2018. Get inside where it's warm and wet and treat the kids to animal shows, activity stations, a dance party, midnight beach ball drop, and both champagne and grape juice toasts. Because your kids certainly aren't going to make it to midnight (if you have anything to say about it) — and there's a good chance you won't either! Balloons drop at noon and 2 p.m., with tons of fun activities and favors throughout. Who loves Playport more — you or the kids? This NYE, it doesn't matter, and you can all enjoy with party favors, $1 hot dogs, sparkling grape juice at midnight and a ball drop live stream. Nama-stay connected with your partner into the new year as Betty Amatangelo guides you through gentle movements that are suitable for both beginners and more experienced yogis. 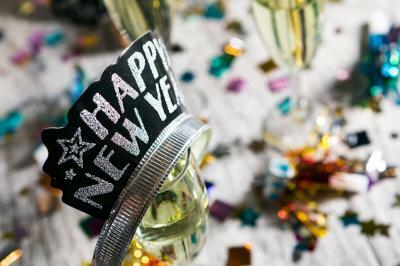 A perfect way to celebrate NYE with your older kids or a great way to start that 21+ night. Go Otters! A beautiful (and easy) three-mile walk, starting at the Stull Center at Presque Isle provides a gorgeously chilly nature-filled alternative to your typical hot and boozy party, with a celebration at midnight! Too fun not to share, even if it's not necessarily NYE. A brisk 13-mile bike ride will have you oohing and ahh-ing anew over PI, and the ride doubles as a blanket/winter weather wardrobe drive (so bring new/gently used coats, mittens, scarves, etc.). Erie's newest in elegant dining is offering up three seatings for a scrumptious and decadent four-course meal that includes a complimentary glass of champagne and live music. There is a lot going on at the casino for NYE, so whatever your tastes or budget, if you'd like to combine your partying with some slots, this is the place to be. Two shows, both featuring outrageous personality April Macie, and both with dancing to live music from the Pop Rockets, but the 9 p.m. event also includes champagne and a hot breakfast buffet. What better way to ring in 2019 than by celebrating that crazy time when Prohibition finally got struck down? The ales of featured brewery 21st Amendment, live music, prize drawings, and tons of fun abound. Put on your party-best (formal — no sneakers!) and boogie down with tons of old school jams like Marvin Gaye, Michael Jackson, Mary J. Blige and more, plus a breakfast buffet. Guests can purchase party-only tickets, but The Avalon will be offering terrific overnight packages that include free parking, a breakfast buffet Tuesday morning, dinner credit at their in-house restaurants and, of course, a raucous good time at their NYE party. Boogie down the Hollywood way at the Bayfront Convention Center for a glitzy night of glamour. After taking wining and dining in Erie to a whole new level, Room 33 is bringing blues in the form of Ron Yarosz to their speakeasy for an ultra-elegant evening. Thankfully the Brewerie's got puns, live music, DJ entertainment, and an open bar plus hor d'oeuvres included in the ticket price. Don't forget — your favorite neighborhood bar, like the Sandbar, probably has a sweet party going on, and in this case, you can count on snacks, party favors, champagne and a buffet for an even sweeter low price. Topping off a stellar year of live music and activities, both floors at KRC will be rockin' for their NYE party. Enjoy the optimistic apocalypse and a New Year's cigar with Mckenzie Sprague, her band Cult Classics, and special guests.